1. Scotland did not emerge from the ice with title deeds attached, nor has any square inch of Scotland passed down peacefully within the family from generation to generation from its original settlers. On the contrary, all land in Scotland has changed hands by murder, theft, extortion or deceit, most of it many times. There is no land-holding in Scotland now which is not based at some remove on malfeasance. Property rights have been arrogated by force, or handed out by authorities with greater or less legitimacy so to do as suited their needs over the sweep of historical time. 2. In any case, these dispositions of land do not serve modern Scotland well. However those who now own land came to own land, assigning the management and benefits of a scarce and vital resource to individuals on the basis of their heredity is neither a just nor a rational policy, and should not in the modern age be a tolerable one. If we seek to build a just and equal society in Scotland, the inheritance of significant areas of land must cease. 3. I am not someone who would seriously propose hanging the lairds from the lamp-posts, but if we do not address the accelerating concentration of wealth and power in society, of which the concentration of land holding is a significant aspect, ultimately violence and disorder must ensue. The seeds of the French Revolution, so we are told, were in taxing the poor to subsidise the rich; and yet that is exactly what we are doing in Scotland today. 4. Consequently it is essential that we take dramatic action now to reverse this concentration, to break up the very large land holdings, to settle more people on the land with good security of tenure, and to take a very significant proportion of Scotland's land, especially our uplands, into common ownership. 5. The default state of land in Scotland in future must not be that it is property, but that it is common. 6. Fewer than 1000 individuals own 60% of all the land in Scotland. This represents a small number of very large estates, managed, generally speaking, with no thought whatever to the common weal. 7. When we consider large private land-holdings in Scotland which are arguably in the public interest, Grangemouth petrochemical works is the largest at some 700 hectares in total extent. Edinburgh and Glasgow airports are each smaller. Clearly, both the Grangemouth works and our large airports are significantly profitable and could bear a burden of taxation without endangering their viability. 8. Scotland has a land area of 78,000 square kilometres and a population of five million, which equates to 67 people per square kilometre or one and a half hectares per person. In natural justice it seems hard to assert that one person has more right to the enjoyment of the land than any other. Yet Richard Walter John Montagu Douglas Scott1 monopolises 111,369 hectares, arrogates the birthright of 74,000 Scots. The landed lobby complain that redistribution of land would be 'theft' which, they claim, would violate their 'right to property'. But the theft has already taken place, and time does not give good title to the proceeds of crime. However, as I shall argue below, redistribution can be achieved not by confiscation nor by compulsory purchase, but by the simple processes of ordinary taxation. Land which the owners voluntarily vacate because the burden of taxation is too onerous is not stolen, it is given up – or, to speak more honestly, returned to its rightful state. 9. In any case, however redistribution is achieved, achieved it must be. As this graph shows, 1% of the population own more property by value than the other 99% put together. A community built on such gross inequity cannot stand. 10. I am grateful for the Land Reform Review Group's proposal for a fixed upper limit on private land holdings. If we were to take, as an example, an upper limit of 1,000 hectares – four square miles – and limit each of the big estates to this, we would release enough land to create quarter of a million new crofts. 11. However, I feel that very large holdings are best dealt with by fiscal means. If landowners are required to sell or surrender lands exceeding a fixed maximum area, I fear we might be bogged down in long running, complex and expensive litigation. Consequently I propose a tax, possibly in addition to a land value tax, payable on all private holdings of land but which scales exponentially with the total area of all holdings with common beneficial ownership. 12. The core of the idea is that a landowner pays a small amount on their first hectare of land, a little bit more on their next hectare, a little bit more on their next, and so on. There are two key numbers in this idea: the constant, c, which is the amount of money you pay on the first hectare, and the exponent, e, which is the power the number of hectares we've counted so far is raised to to calculate the little bit more. So what is due in tax per annum is Σ1..n(cn)e, where n is the number of hectares owned. 14. As you can see from the table, based on these values for c and e, the tax due on the Grangemouth petrochemical works, or on the airport, would not be not onerous as a proportion of the business revenue. The tax on the Duke of Buccleuch would be unsustainable, even for him. Yet this is the same tax, levied under the same simple rules, on each holding. 15. As a detail to this, the exponential tax might possibly be levied only on land that was heritable; that is to say, a landowner, being a natural person, might elect not to pay the exponential tax. The rationale for this is that it is not really the ownership of land which causes the greatest social cost: it is the locking in of ownership to particular privileged families, persisting through time. 16. Under this revised proposal, if the landowner1 did elect not to pay the exponential tax, then on his or her death the land would revert to common; they would have, in effect, a liferent only. Or an owner being a natural person might elect to pay the exponential tax only on a specified portion of their holding, in which case that portion would be heritable and the remainder would revert to common on their death. 17. Obviously an entity not being a natural person could not elect not to pay the exponential tax as such entities do not have limited natural lifespans; obviously also, a landowner, being a natural person, who had elected for a period not to pay the tax could not start paying the tax and immediately regain the benefit of heritability. 18. This proposal does not mean turning distressed gentlefolk out of their castles and their mansions to wander destitute upon the highroad; on the contrary, it leaves them with amounts of wealth which are to their fellow citizens unimaginable. But it does mean that within one generation, fully half the land of Scotland would revert to common, available to local communities to employ as they see fit for the common benefit of the land, the community and its people. 19. Much has been made of the depopulation and social disruption that has afflicted the 'crofting areas' - the Highlands and Islands. I do not wish to minimise that in the least. But depopulation and social disruption has affected areas of Galloway on an equally devastating scale. My home village of Auchencairn had, in the 1880 census, around 2400 inhabitants; it now has 180. That raw figure sounds devastating, and it is; but the truth is worse. 20. Of the eighty or so stone built houses which make up the core of the village, only two are now occupied by people born in the village, and those people are in their eighties. No more than six houses on Main Street are occupied by people of working age. There's a reason for that. The price of even a modest house is now of the order of two hundred thousand pounds, and local wages are depressed: the average working wage in the region is £20,800. So it simply isn't possible for people earning their living in the local economy to buy a house. 21. The reason for this is that people retiring from the cities, with the proceeds of selling an urban house, can outbid local people, and have done so. Most of these people are resident - only about 10% of houses stand empty - and many of them make a positive contribution to the community. But nevertheless their interests are different from the interests of people who need to earn a living in the local economy, and that does skew communal decision making away from economic development. 22. Furthermore, with the local private housing monopolised by incomers, what 'native' - second or third generation, or more - villagers remain are corralled into a bantustan of 'social housing' on the other side of the burn, leading to a community divided between white settlers in the increasingly gentrified village and natives in the social housing. This is not a good thing. 23. And finally, it's even worse than that. The people of my generation born in the village who remain in the village are the children of farmers who inherited the family farm, and those families which have subsisted largely on social benefits, and who therefore qualify for social housing. There's virtually no-one in between. Everyone else went away to university and never came back. There are no jobs for them, and there is no housing they can afford. 24. I'm painting a bleak picture. Driving through, you'd see a pretty village, and a vibrant village, with its own newly built, community owned post office, with its recently renovated village hall, with its new community allotments, with its generally well kept and pretty houses. It's true that, by comparison with many other villages in Galloway, Auchencairn is doing well. Nevertheless, my picture is also a true one, and it is a picture of depopulation and social disruption every bit as bad as that experienced in the West Highlands. It's just less visible. 25. Auchencairn, of course, is by no means unique. In villages throughout remote rural Scotland this pattern is repeated. A second clearance is being perpetrated; local people with real knowledge of and investment in the locality and its landscape are being progressively driven out, to be replaced by a population of incomers who, because of their age when they arrive, are active and effective members of the community for only a few years before being replaced in their turn with new strangers. These are not social conditions in which community can be sustained. 26. As stated above, Auchencairn does not have a particular problem with second homes, but we all know areas of Scotland that do. The problem of second homes can be even worse for fragile communities than the problem of retirees, since their owners do not have time to put energy into community projects, and buy most or all of their needs in urban centres, where prices are lower. 27. Three strategies could address the second home issue. Firstly, there could be a formal change of use required to convert a dwelling house into a second home. Secondly, there could be sharply increased taxation on dwelling houses left unoccupied for more than 180 days (or some other defined period) of the year. Thirdly, in conjunction with a policy to promote and greatly increase hutting, use of dwelling houses as second homes could simply be banned. 28. A significant promotion of hutting would have the additional benefit that it would make regular access to the countryside and the land available for city dwellers in all income groups, not only the rich. 29. As an ironic footnote to this, Auchencairn did have, from the end of the First World War into the present decade, a colony of huts at Rascarrel, enjoyed by families primarily from Dumfries. They have, however, all been evicted by a landowner eager to make better profits from holiday chalets. While these issues are outside the narrow scope of this particular consultation, I shall need to make reference to them in some of my responses. 31. I endorse and commend to you the submission of the Birnam Workshop. 32. Land Reform will need to be a continuous process in Scotland for at least the foreseeable future, and the Government will need some body to oversee this process and to develop policy. 33. The Scottish Land Commission will be a prime target for elite capture. The rural 'great and good' – the great landowners and their agents and toadies – are bound to seek places on it, and it must be jealously guarded against them. A personal interest in private ownership of land should be a clear disqualification from appointment to such a commission. 34. Transparency of beneficial ownership is vital. It's (obviously) vital to any scheme of tax which is progressive with respect to the area held. It's also vital to communities seeking to discover who they have to negotiate with in order to achieve some change in local land management. However, such a change must affect current owners as much as incoming owners. 35. Where it cannot be shown who the beneficial owners of land are, for the purposes of a progressive tax all such land must be taxed as though it comprised one estate belonging to one beneficial owner, because it cannot be shown that this is not so. Under progressive tax this will automatically produce a very much higher tax burden on land whose ownership is obfuscated5, strongly motivating owners to deobfuscate ownership. 36. If it is the case that the beneficial ownership of every legal entity registered in the EU is a matter of public record, then this condition would satisfy my concern for transparency of ownership. 37. I can see no disadvantages whatever. 38. There should be some specified and limited time period – perhaps six months – between the date the State notifies the registered owner of irregularities in their registration, and the forfeiture of title in the land. If the irregularities were corrected within that period, the title would not be forfeit. Otherwise the land must revert to common. Once it has reverted to common, there should be no legal mechanism for the former owners to recover it, or to be compensated for its loss. 40. Apart from my own holding, I do not hold any. I certainly wish to be able to access data about landholdings in the Stewartry in particular, and across Scotland in general. 41. I think that a combination of crowd-sourcing based on (for example) the field boundary dataset, in concert with a public web API which allowed links to be made to official records, would enable the state to make use of local knowledge through citizen activism. Clearly crowd sourced knowledge could not be treated as authoritative in itself, but would form a basis for a much richer dataset than could be provided from official sources alone. 42. Ideally the data model would be sufficiently open to support mapping of such things as biodiversity, land management, climate record, public access and other forms of information as well as ownership and planning designation. 43. The Open Street Map and Geograph projects provide models of how crowd-sourcing might work. 44. It is extremely tendentious to claim that 'Landowners are instrumental in promoting sustainable local development and supporting communities.' In most areas the opposite is the case. 45. In general and with a very few honourable exceptions, large private landowners are by their very existence barriers to sustainable development. 46. The appropriate level of public authority to intervene is not in the first instance ministers. Land issues are local issues, and it is communities who should be empowered to intervene and direct. Clearly, mechanisms must be put in place to resolve disputes between communities and landowners, but the presumption must be that community interest should always takes precedence over private interest. Q. 17. Do you agree that public sector bodies, such as Forestry Commission Scotland, should be able to engage in a wider range of management activities in order to promote a more integrated range of social, economic and environmental outcomes? 47. Generally I think Forestry Commission land should be released as common and passed into the care of local communities, as local communities gain the self confidence to wish to take this on. As a founder trustee of Southwest Community Woodlands Trust I appreciate both the need for very long term management and stewardship of woodland and the need for a strategic timber resource; consequently I understand the need for communities to continue to be supported by expert advice and assistance from public service foresters. However it does not seem to me that there is any need either for the ownership of the land to be centralised, or for the final authority for management decisions to be outside the local community. Q. 20. Do you think a trustee of a charity should be required to engage with the local community before taking a decision on the management, use or transfer of land under the charity's control? 48. I have very grave doubts as to whether there is any 'charitable purpose' whatever in owning land, with the possible exception of conserving ancient monuments. Obviously charities may need to own land to provide for their offices, and some types of charity may need to own land for other buildings. But where environmental charities are concerned, it seems to me greatly better that the land should be common and should be managed by the community as common, with the charity providing advice and incentives to influence that management in the direction that it would prefer. 49. So long as charities own and manage land, they will continue to do so to the detriment of the community and of the public interest. Q. 22. How should "community" be defined? 50. Community councils are much maligned. But we have a clear concept of a community council area, normally based on a settlement or a subdivision of a settlement and its surrounding lands. It seems to me that for the purposes of a legislative framework, the collectivity of people normally resident in such an area, possibly considered together with those people with strong associations with the area not currently resident, provide as good a proxy for community as we're likely to get. 51. Under present legislative arrangements, the community council is effectively the collective voice of such a community. As community councils are given more competences and more discretionary budget, elections will become better contested and the quality of people elected will tend to improve. Although there will always and inevitably be some community councils which are not providing the best possible community leadership and service, democratic organisation is always to be preferred to a quangocracy of the unelected sio-disant great and good. 52. Under the principle of subsidiarity, community councils are generally the appropriate tier of government to consider detailed local land issues. 53. It's worth bearing in mind that in many rural areas there are people with strong and long-standing associations with a locality who are not normally resident. These people include, for example, people of local descent who have moved away for education or employment; hutters and others with a long-term relationship with the area as visitors, including the homeless, yacht owners, or caravanners; and, in some areas particularly, climbers and other mountain sports enthusiasts, anglers, cyclists or canoe users. Some mechanism is needed to allow non-residents to register their long term commitment to and interest in a particular locality, and to have some influence over the community council, perhaps a vote in community council elections. But such non-resident registration would have to be limited – perhaps an individual might register such an interest with only one locality in addition to their place of normal residence – and should, I feel, involve some cost. 54. I've said above I'm not persuaded there's a public interest in charities owning land. However, where a charity does own land (and I have been a trustee of a charity that does), if it acts against the expressed will of the local community then, if the dispute cannot be resolved, I think either the land should revert to common or the charitable status should be revoked. 55. Second only to housing Trident missiles, sporting estates are the most obscene misuse of Scotland's land. While I believe a wholesale review of land taxation is urgent, in the interim business rates would be better than nothing. But they would represent a very small amount of revenue in respect of a great deal of territory whose current use is manifestly contrary to the public interest. 56. A very small benefit to the public purse. 57. It might be used as an excuse to delay the much needed general review of land taxation. 58. No, I don't, quite the contrary. Local Authorities across Scotland are disposing of or building on common good land to make up for temporary shortfalls in their budgets, and this cannot continue. There should be extremely strong safeguards against further disposals or changes of use of common good land. Q. 28. If removed, what should take the place of court approval? 59. A plebiscite of the local population might be an alternative, subject to a minimum turnout guard. 60. I'm not qualified to comment on this. 61. I'm not qualified to comment on this. 62. There is a distinction between common good land and common land. 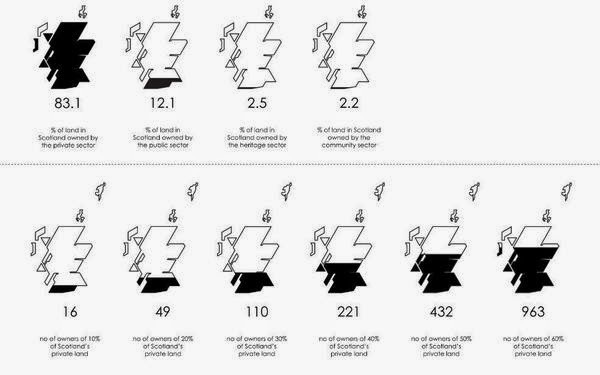 I would like to see a public policy commitment to having at least 50% of Scotland's land area common by 2050. I would like to see the total area of common good land also increasing rather than decreasing. 63. Scotland's tenant farmers are among the most exploited and oppressed groups in western Europe. Such legal protections as they have are minimal, and many live in unfit habitations under constant insecurity and bullying. Tenant farms are very often marginally profitable, with virtually all the surplus being gouged by the landowner. We hear regularly of tenant farmers being sanctioned when they make any public protest against their conditions. 64. Under these circumstances it is ridiculous to suppose that tenant farmers, unsupported, could make adequate representations to parliament to make their voice heard, against the extremely well funded public relations and lobbying machine that is Scottish Land and Estates. 65. It is vital in order to protect the interests of tenant farmers that reforms of such protections as they have are passed within the body of the Land Reform bill, in order that they may have the support of a wider activist body. 66. I'm not aware of anywhere in Scotland where the present arrangements adequately protect the public interest. 67. The issue of the overpopulation of grazing and browsing animals on Scotland's uplands needs to be addressed urgently and seriously, since erosion of topsoil is happening at an unsustainable rate and problems of storm water runoff are greatly aggravated by the lack of forest cover. Flooding and landslips have become pervasive problems in many parts of Scotland at huge cost to the public purse, while open scree is growing in many areas leading to instability of hillsides. 68. It needs to be remembered that the 'natural' state of almost all of Scotland is forest. There are productive forests in Norway at higher altitude than the peak of Ben Nevis. While heather is a native species, large open heather moorlands are not natural. They are man-made wet deserts, with extremely impoverished ecosytems. Where grazing pressure is taken off, at all altitudes at least scrub and in most places forest will make a natural recovery. 69. The problem is not only deer. Grouse also contribute, as do sheep, and in some areas wild goats. There are sustainable levels of population for all of these species; all are present at sustainable levels in Scandinavian boreal forests, as are elk, a species once native to Scotland. However, without climax predators there is no natural mechanism here for maintaining sustainable populations. 70. We should reintroduce Scotland's native climax predators: lynx and wolf most urgently. 71. While predator populations are re-establishing, either landowners must be required to cull browsing and grazing species to levels at which forest cover can regenerate, or else the State must intervene directly and cull. 72. People would be able to drive over the Rest and be Thankful in winter. The burghers of Elgin would not be flooded out of their homes. Tourism would increase. Q. 38. At present, section 18 of the Land Reform (Scotland) 2003 Act is silent on the issue of resolving objections to a core path plan consultation. Do you agree that access authorities should be required, in the interests of transparency, to conduct a further limited consultation about proposed changes arising from objections? 74. The Land Reform Act 2003, where enforced, is an admirable piece of legislation which has been of great benefit to everyone in Scotland. However, the problem is that it has not been sufficiently enforced, and some landowners still seek to dissuade or restrict access to their land, and public bodies do not do enough to enforce access rights. 75. The behaviour of the Loch Lomond National Park Authority in this regard is particularly disappointing. 76. I agree that section 20 of the 2003 Act should be clarified so that Ministerial direction is not required when an access authority initiates a core path plan review. Once again, land issues are local issues. The appropriate level of public authority to act is the community council, or, for longer distance paths, the local authority. 78. It is not acceptable in the twenty-first century that we should perpetuate inherited privilege through land-holding. It cannot be acceptable that changes in the management of land are made without the consent and involvement of the people of the locality. Land cannot, ultimately, be allowed to be a private resource. It belongs, inalienably, to everyone or to no-one. 79. If we are to create a Scotland where every person is equal, a socially just Scotland that is at peace with itself and can hold its head up among the community of nations, then everyone must have equal access to the land.